With winter firmly behind us (wahey!) it’s time for us to delve in to our springtime project making and what’ve better to get you started than a free paper download. Seriously though, how cute are those bunnies?! Maxine is going to take you step by step to create this bee inspired card. We love the honeycomb shape, how sweet! 1. Measure down 4cm from the top left and right hand corner and make a mark on your Dovecraft 6x6 card blank. Then, measure 4cm up from the bottom left and right hand corner and make a mark. From each mark, draw a diagonal line to the top or bottom edge. 2. Carefully cut along each drawn line, you should now have an octagonal card shape. 3. Cut a 15.5 cm x 15.5cm piece of paper from your free download, adhere with Dovecraft Perma Fix tape to the front of your card blank. Trim the corners and any excess paper. Maxine has used the honeycomb paper to match her honeycomb inspired card shape. 4. 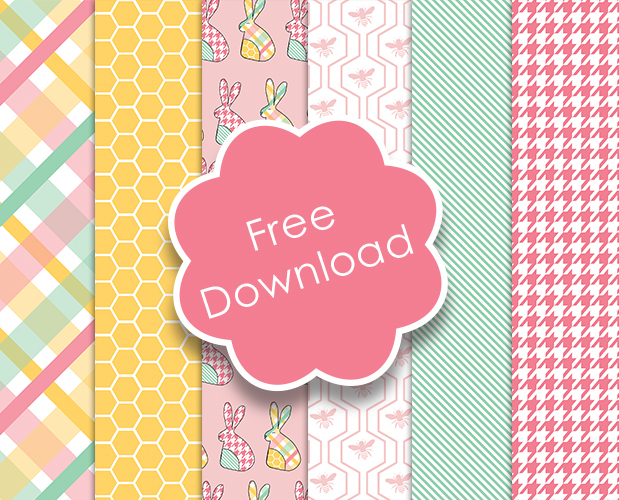 Choose a complementing paper design from your free download and cut a 15.2cm x 5cm strip. Die cut two of the flower border strips from the First Edition Borders dies set on to a sheet of First Edition yellow textured card stock. Adhere both along the bottom of the paper strip, cut any excess so it fits along the strip. TIP – Join the border die strips on the right side of the strip as the next piece of paper will then cover the join. 5. Stick your strip down with Dovecraft Perma Fix tape horizontally, to the centre of your card design. 6. Next, cut a 7cm x 13cm coordinating piece of paper from your free download, adhere to the right side of the card, vertically, ensuring to cover the join in the border strip. 7. Pick another design from your free download and adhere a piece to the back of a Dovecraft Blooming Lovely wooden frame. Glue your frame horizontally, to the centre of your card design. 8. Die cut two Blooming Lovely butterflies on to a contrasting paper design from your free download. Shape the wings with a pencil and layer together with 3D foam pads. Stick your layered butterflies down to the top left hand corner, inside your wooden frame. 9. Stamp the Blooming Lovely ‘Hello’ sentiment on to a piece of First Edition yellow textured card stock. Once dry, cut out and adhere to the centre of the frame with foam pads. TIP – Do not put foam pads on the section that will go across the frame. 10. Add Dovecraft Perma Fix tape to the back of a yellow, Blooming Lovely wooden peg and adhere to the left hand side of your card design. 11. Stamp the Blooming Lovely bee design onto yellow card stock, cut out. Put foam pads on the back, layering them up to make more height. Adhere to the card placing the top of the stamped paper, in the peg. 12. Die cut the word ‘Spring’ from the Blooming Lovely dies set onto First Edition Yellow textured card stock. Stick this down along the bottom of your card design, with 3D foam pads. What a wonderful card design that will BEE sure to make anyone’s day a little sunnier! Who said that making shopping lists or to-do lists has to be a boring task? Why not create a notes board with your chosen paper designs, glue on your pegs and pin your post it notes to it? This will look wonderful in your kitchen and it’s mega handy! How will you use our free paper download? Make sure to upload your lovely makes in to the inspiration area so we can see and to #trimcraft when sharing on social media. What an inspiring lot of ideas, thanks so much, I'll be having a go this weekend with the freebie papers.